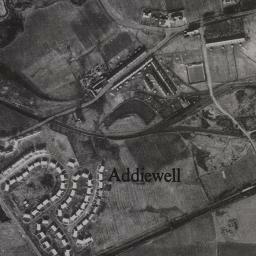 Aerial view of Addiewell in the late 1950s, as the old village gave way to the new. At school there was Lucy Callaghen (school teacher), Harold Brady (headmaster) and Miss Lavery- the latter taught my Dad. There were wee bottles of milk and drawing in Harold Brady's class; Stuart Watt could always draw the best and I used to draw Spitfires and tanks. There was also the school dentist, the "fitba" team and the nit nurse. There was Helen Conroy taking us "cubs doon the Skolie Burn for a sausage hike," which had to be a link sausage because lorne sausages were a no-no. Also, the circus at Addiebrownhill with the "big boys" trying to stay on the donkey for a fiver. It wasn't until years later that we found out that there was a burr under the saddle. I remember Russell of Bathgate lorries when Shug Campbell used to say 'you will be a lorry driver Tommy and you will work for Russell.' He was right and I did! There was also the sound of John Conroy's two- stroke- commer -tipper lorry leaving Dykes on a cold and frosty morning and also Pat Tierney's coal lorry. I used to carry coal with Pat on Saturday morning, which he would gave me a fiver for- I thought I had won the pools! That fiver got me to the poly on Saturday night and the steading on a Monday night: happy days. (End of part one). This page was added by Tommy Woods on 12/10/2012. Great memories Tommy. I remember Ms. Lavery, she and her sister still lived in Livingstone Street when we were younger, one of the few houses there that's still occupied. Then they moved to Loganlea and moved into my grandparents old house up at the top of Loganlea, by Ross' farm. I think someone should write an article about her as she is someone most of us remember. The Lavery's were good people. My grandfather, Tommy Foley, was a widower and lived above the Lavery's in Livingstone Street. This would be around 1917 as my mother was born in 1917. He was raising the children by himself while working nights in the coal mine and Mrs. Lavery (Ms. Lavery's mother) would keep and eye on them when he was at work and my mother said all of the Lavery's were very good to them. Maybe William or John Lavery could write an article about their family. Do you still keep in touch with them? PS: Ms. Callaghen's family lived in the house Billy Kane lives in now when I was growing up in Loganlea. I lived in Meadowhead Avenue for a few years in the Sixties. I remember Pat Tierney's coal lorry that doubled as a removal truck when someone was flitting. And his big alsatian, or to be p.c, his large German Shepherd. The Dinwoodie boy used to walk it, or was it the other way round...Down the street there was a wee dog behind the fence that use to run up and down madly barking at all who walked past. The old woman came out and shouted at the kids for tormenting her dog. Now I am not saying that never happened but many an innocent got an earful. I remember your dad's van, blue I think. Not a lot of cars around then. I remember you kids playing football in the street and, if I'm not mistaken, you with your wee brother in your arms letting him join in. Interesting to hear you helped Pat with the coal, didn't you do a bit in Davie Bertram's garden too? I remember the boys on the wire, they were lucky. Not so lucky was the wee boy who drowned in the earth works behind the bond. I saw Ian Scott running along the ashy path that day and knew something bad had happened. Also lucky was my own son; your sister came to my door and told me he was up on the windowsill in the front bedroom, when I got up there he was trying to open the widow. Thank goodness she came to the door. When he was a bit older that same son, along with Michael Tierney, got a good clout from Maggie Mitchell for jumping on the back of the van delivering bread to Mackie's shop. If the van had got out on the main road they would have been in serious trouble. Thank God for good neighbours, clouts and all! Nice memories Margaret no sae good about that poor wee boy being drowned. I did do a bit of gardening for Davie Bertram, you are right there, and for auld Mrs Penikid. My dad's van was blue and it was that auld heap of a minibus that I passed my test on in 1967. Watch this space because you, Anne and I have a lot more memories of auld Addiewell to put down before I lose my marbles or 'bools' as us Addiewell folk called them. All the best and keep watching. I lived at 21 Meadowhead Avenue (next door to Arthur and Pat Murray) for years before moving to Loganlea. My wee sister Margaret was born there; delivered by one of the two nurses who lived in the Avenue. I remember well walking home from school and taking the shortcut across the fields. Alice Cameron was usually with me - she used to swing on the cow's tails and we used to fish for minnows in the wee burn that ran through that field. I also remember the boys on the wire; my nephew, Tommy Cassidy, came running in to tell my mother and the words just came tumbling out of his mouth. He was so excited that what he was saying made no sense at all! After calming down, we managed to understand what he was saying! Many years later I worked at Meadowhead at weekends to make extra pocket money. I have great memories of that and all the characters who came and went (usually well on). I worked with James Doyle, Benny Murphy and Michael Doonan in the Steading, in it's Hey Day, Meadowhead was a bustling Hotel and quite a few personalities came there. I now live in Barbados but have the fondest memories of living in Tintown and Dykes! "Davy Bertram sells fish tuppence ha peny a dish/ dinnae buy it, dinnae buy it, 'cause it's dipped in coo's p**h."
They don't write them like that nowadays!